I’d like you to meet a friend…..
And here’s her FB page. 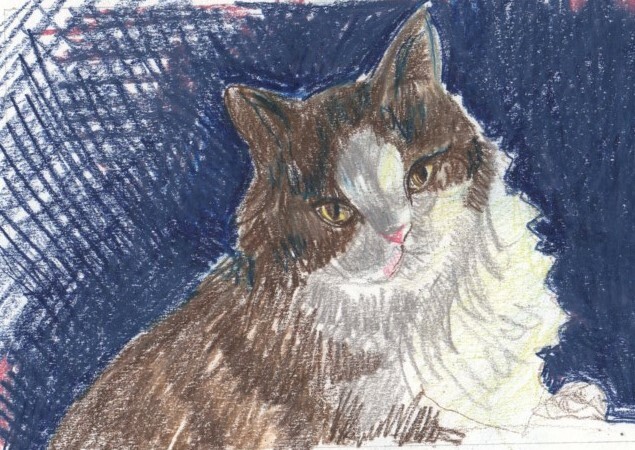 As I was saying…..I was looking for an animal cause for which I can do pet portraits. I remembered my old high school buddy, Mrs. Dolittle. She’s a holistic healer for animals, and I’m going to try to raise money for her to give hospice care to pets whose families wouldn’t otherwise afford it. So, I’m dividing my time between “Floral Overload”, and making sample pet portraits. So, I plan to do another kitty, two doggies, one horsie, and one bunny. And put them on a postcard to advertise. The originals will be double matted, as will the finished product sent to customers. Boy, it feels great to have an actual direction again! That’s a great idea and very sweet of you. It’s so nice she’s taking care of hospice animals. Thanks for the compliment….and yes, aside from being a wonderful healer, Mrs. Dolittle is a great person, too.